A lot of who I am can be understood by observing wolves. 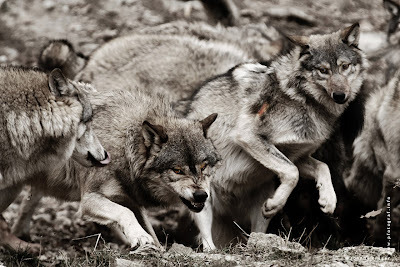 While there are many aspects of wolves that I could draw upon for the content of this conversation-- their tribal tendency and territorial nature, just to name a few-- I'm going to focus on their inherent authority. I've been made aware of a trend over the past decade or so that people LOVE my strength-- resourcefulness, provision, and protection-- but not my authority. When I'm in a pack of humans, I naturally take charge with or without formal agreements... and this can be very disruptive. Notice something: I said naturally. Before jumping to narcissistic conclusions, consider for a moment that most of us are relatively unaware of how we show up in our own lives. Perspective on our own personality and heart is difficult to see on our own which is why we need to have a community of others surrounding us. Most of what I'm about to share has been the result of others speaking into me and seeing me, really seeing me. When I show up, I don't need to assert myself nor does it take effort on my part to take the lead. I don't need to jockey for position nor do I feel it necessary to play games. When I'm standing in the strength of who I am, I lead. And I don't lead from the sidelines or periphery, I lead from the front. I'm an Alpha though I don't need to proclaim it to be so; it's simply how I show up. Like the sun in the sky, I shine best when I'm out front. And this aspect of who I am either repels or attracts others to my leadership and leaves little room for middle ground. I've been told by a mentor and friend that this posture toward me is a lot like how people responded to Jesus. Jesus didn't leave room for fence-sitters. He is the King. His presence carries authority. I, too, am a king under his Kingship and rule. I have a domain and territory given to me by Him to steward and so I show up as a king, as an Alpha wolf among my pack. This makes me dangerous. Just like in Narnia, Mr. Beaver could say of me, "Of course he isn't safe... but... he's GOOD." My heart of intent in all circumstances is always to "set hearts free." This is the context of my leadership, the underpinnings of my authority: to set hearts free. It frustrates me to no end when for the sake of freedom I take the lead only to be boxed up or compressed into a smaller role. In that place, I will bite when I'm backed into a corner. I will fight because my territory is in jeopardy. Freedom is at stake and I refuse to back down, to play small because it's safer. Remember, I'm an Alpha. I'm a wolf. I cannot be tamed or domesticated. I am meant to roam the wilderness lands with my pack. Yes, my provocative howl strikes fear into the hearts of the timid, the posers, the wannabes... but it is for their unleashing and advancement that I am fierce yet tender.